The Android Framework provides access to raw GNSS measurements on several Android devices. Note: Google has released version 2.6.3.0 of the GNSS Analysis App. For more information, see the GNSS Analysis app v2.6.3.0 release notes. This article lists Android devices that support raw GNSS measurements as well as tools to log and analyze GNSS data. You can find the tools in the GPS Measurement Tools repo on GitHub, which includes the GNSS Logger APK and the GNSS Analysis app for Linux, Windows, macOS, and the Installation and User Manual. Original equipment manufacturers (OEMs), developers, and researchers can make use of the tools in this page to test new phone designs, validate functionality, develop new algorithms, evaluate improvements to the GNSS system implementation as well as building value added apps. Before you can get any raw GNSS output, you need to make sure that you have a device that can capture such data. Most devices manufactured in 2016 or later and shipped with Android 7.0 or higher provide raw GNSS data. Accumulated delta range or carrier. The table below lists devices that support raw GNSS measurements and the data they provide. This isn't a comprehensive list, you should contact the manufacturer to make sure that a specific device supports raw GNSS measurements. 4 Raw measurements are provided only when a GPS position is available. 5 No duty cycling. Works only on the non cellular version of Nexus 9. For more information about the data provided by a device, see Global Navigation Satellite Systems. You can use Android Studio to build an app that captures raw GNSS measurements and logs them to a file. 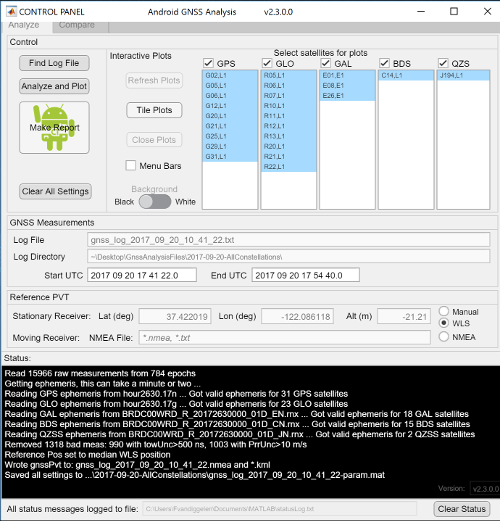 The GPS Measurement Tools project includes GNSS Logger, a sample app that shows how to log data related to Android location, including raw GNSS measurements. Download the GNSS Logger APK to install the sample app in your device. To get GNSS output with the sample app, your device must support raw GNSS measurements. For more information, see Android devices that support raw GNSS measurements. Once you have captured the GNSS log using the GNSS Logger, you can copy the log files from the device to your computer for further analysis. From within the GNSS Logger you can send the files to yourself via email or save them to Google Drive. Alternatively, you can save the files using the file management app on the device, or you can use the Android Debug Bridge (ADB) as explained in Copy files to/from a device. To browse the sample source code, see the GNSSLogger folder in the GPS Measurement Tools repository on GitHub. The GNSS Analysis app reads the GPS/GNSS raw measurements collected by the GNSS Logger and uses them to analyze the GNSS receiver behavior, as shown in figure 1. You can download the app for Linux, Windows and macOS, systems, or download the Installation and User Manual. Figure 1. GNSS Logger collects the measurements that can be consumed by GNSS Analysis. The GNSS Analysis app is built on MATLAB, but you don't need to have MATLAB to run it. The app is compiled into an executable that installs a copy of the MATLAB Runtime. Select which satellites are displayed. Control the reference position, velocity, and time (PVT) used for calculating measurement errors. Define a window in the data between start and end times. 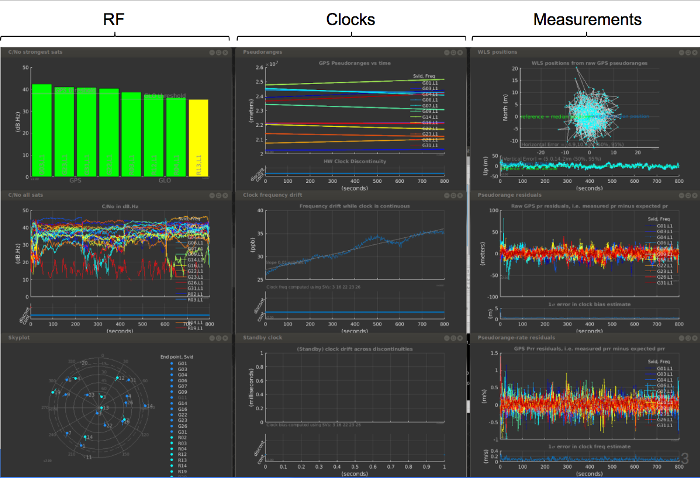 The GNSS Analysis app provides interactive plots organized in radio frequency (RF), clocks, and measurements columns, as shown in figure 3. Figure 3. GNSS Analysis app displaying interactive plots. For each constellation, the four satellites with the strongest signals. For each satellite, the time plot of carrier to noise density (C/No). The skyplot of satellite positions. Latitude, longitude, and altitude entered by the user. National Marine Electronics Association (NMEA) file with truth reference PVT. Note: One of the major benefits of using raw measurements is that you can observe the receiver clock behavior with a precision of at least 1 part per billion (ppb). This is important to watch when building a device, because any heat source near the reference oscillator might cause the clock error rate to increase rapidly. The offset of the standby clock that keeps time when the receiver resets the duty cycle of the primary oscillator. The weighted least squares position results obtained from the raw pseudoranges. The weighting is done using the reported uncertainty of each measurement, which is part of the raw measurement API spec. The errors of each pseudorange for each measurement. The errors of each pseudorange rate for each measurement. Note: A major benefit of raw measurements is that you can analyze the errors of each measurement, which provides great insight into the signal environment and receiver behavior. GNSS Analysis can generate a test report, as shown in figure 4, that evaluates the API implementation, received signal, clock behavior, and measurement accuracy. For each case, the app reports whether the receiver passed or failed the test based on the performance measured against known benchmarks. The test report is useful for device manufacturers, who can use it as they iterate through the design and implementation of new devices. To generate the test report, click Make Report. The Compare tab provides a side-by-side comparison, shown in figure 5, of C/No from several GNSS log files, which is useful when comparing the RF performance of several devices. Read data captured with the GNSS Logger sample app. Compute weighted least squares position and velocity. View and analyze carrier phase. Full Support of multi-constellation and multi-frequency GnssLog analysis, including L1-L5 analysis, and report enhancement with PASS/FAIL results. Fill missing discontinuity counter increments from the GNSS chipset in the case where ReceivedSvTimeNanos is adjusted without reporting an increment. A warning is generated to report this issue to the end user. 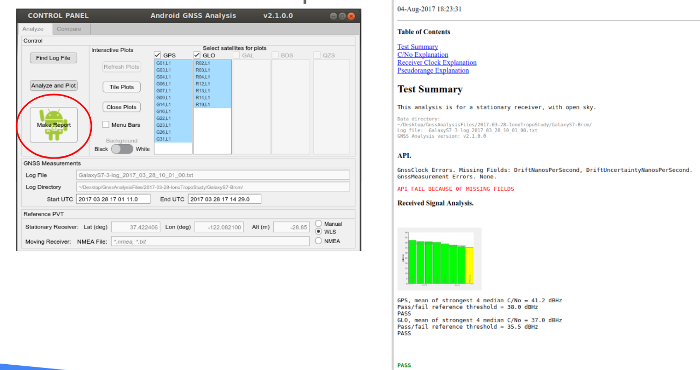 Added PASS/FAIL/WARNING logs to the Gnss Analysis Report related to mandatory and highly recommeneded raw GNSS fields. Epochs with Full Bias not set or set to max integer are no longer considered for analysis. GLONASS satellites reported in part of the log with FSN IDs and other part as OSN IDs are now merged. Optimized for execution speed and stability. We want to improve the support for GNSS on Android. Let us know about any issues with GNSS support on Android by using the GNSS issue tracker. Please check if your issue has already been addressed in the FAQ before posting it. If you have used the GNSS Analysis tools, please provide feedback by answering a short survey. If you have other questions or a request for support, see Developer Support Resources. You can find answers to frequently asked questions in the GNSS Analysis Tools FAQs.